So it turns out there actually is a way to inform your device (as long as it's Android 4.1 or above) which WiFi networks are actually mobile hotspots. It can't (or doesn't, anyway) do this automatically, and having your other devices connect to your mobile hotspot and then download large program updates is no fun! 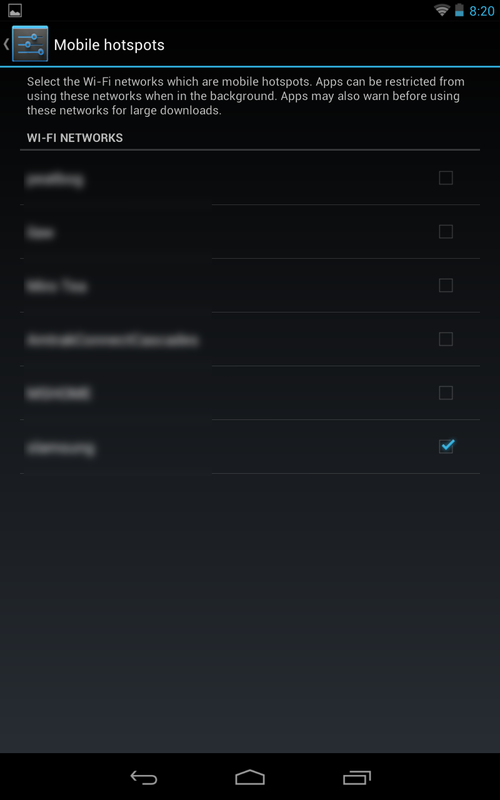 So I discovered the somewhat elusive option in the settings and thought I'd share. You'd think that to mark a WiFi network as a mobile hotspot you'd check under WiFi settings, right? Turns out this isn't the case; the correct place is actually under Data Usage. And that's it! Pretty simple. 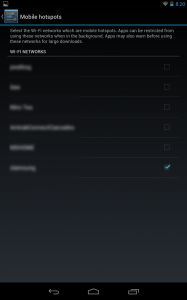 If you're a programmer, you can check for this pretty easily (still requires Android 4.1, though). The tricky bit is it's not a mobile hotspot flag you're looking for -- it's whether the connection is metered (limited). I haven't actually tested this, but I think this should work -- other than the way Context is referred to (which could be replaced with getApplicationContext() or another Context-getter).